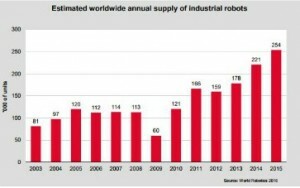 Robots 2015: By far the highest volume ever recorded In 2015, robot sales increased by 15% to 253,748 units, again by far the highest level ever recorded for one year. The main driver of the growth in 2015 was the general industry with an increase of 33% compared to 2014, in particular the electronics industry (+41%), metal industry (+39%), the chemical, plastics and rubber industry (+16%). The robot sales in the automotive industry only moderately increased in 2015 after a five year period of continued considerable increase. China has significantly expanded its leading position as the biggest market with a share of 27% of the total supply in 2015.